The pending state action on a Regional Transit Authority will hold up resolution of a Washtenaw County transit system. Or it should. The effect of Snyder’s plan was to throw off the schedule for the Financial Task Force, a blue-ribbon committee of local notables who were tasked with the job of coming up with a financial “white paper” to back up the regional (countywide) transit plan. (We’ll call this the TMP, to distinguish it from Snyder’s proposed Regional Transit Authority or RTA). The chair of the task force, McKinley Properties’ Albert Berriz, summarily changed the course of the FTF’s work so that a final report was delayed to January 27, 2012, then to February 29. (The actual text of the legislation was not released until January 2012; see the report by the Chronicle.) Here is a sheet showing a list of all bills in the transportation package and with links to the Michigan Legislature page that shows their progress through committee to passage. Note that very useful legislative analyses and summaries are found on some of the linked pages. The reasons for the anxiety are better illustrated with a diagrammatic summary of changes in relationships among transit agencies that was released March 13 via AnnArbor.com. As the article says, the diagram was prepared by Richard Murphy (known around here as “Murph”), who now works for Conan Smith at the Michigan Suburbs Alliance. Note that AATA currently receives funds directly from the Federal Transit Administration (the only agency in the region to do so). AATA has been very effective at applying for Federal operating and capital funds. Berriz fretted that that “foundation” of significant funding could be endangered. Under the new legislation, AATA would become merely one of several regional transit agencies. Federal funding would go directly to the RTA, to be forwarded to each regional transit agency. This is the feature of the new legislation package that especially had the FTF worried. Another feature that has left some of the process up in the air is the prospect of a new funding stream via a vehicle registration tax. So how did we get here? Some of the history is known, some has evidently come through private conversations among people with an interest in metro Detroit and in the future of transit in the region. (Among other things, inadequate transit is seen as an impediment to economic activity.) But clearly Conan Smith and his wife (State Senator) Rebekah Warren have been intensively involved. Last year (June 2011) Warren introduced bills that would establish an RTA in the Detroit metro region. (The story in AnnArbor.com makes it sound as though the intent is to support passenger rail funding; it includes enthusiastic quotes to that effect from Ann Arbor’s Mayor John Hieftje.) Smith, in his guise as the executive director of the Michigan Suburbs Alliance, has a clear interest in enhancing economic vitality of the Detroit metro region. Warren’s bills would have created a transit authority that included only Wayne, Oakland and Macomb counties. They were never taken up for action, or at least did not make it out of committee. Be It Therefore Resolved that the Washtenaw County Board of Commissioners supports the creation of a new Regional Transportation Authority to enhance interconnectivity among the communities of the southeast Michigan region and urges the participants in the 2011 Southeast Michigan Regional Summit to aggressively pursue work that meets the above outlined goals. Smith then subsequently became one of a group that also included the Mayor of Detroit and 3 elected county executives who pledged to promote a regional transit authority (MLive described the group). In a little over one month later, Governor Snyder released his transportation plan. And now, Washtenaw County is included in the Regional Transit Authority that was originally confined to metro Detroit. Smith is now heavily involved in negotiation about the makeup of the bills. Appearing before the state Senate’s transportation committee, he even indicated that one of Washtenaw County’s representatives to the RTA could be surrendered, if that would help (account from the Chronicle). His role at the Financial Task Force was to explain and predict the course of the bills. 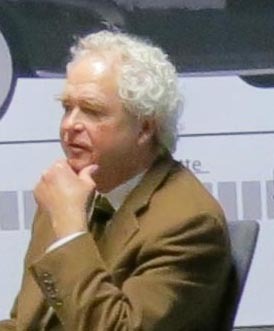 (Jesse Bernstein, chair of the AATA board, said that he would be meeting with Smith separately to insert material into the legislation that would specifically protect AATA by making it the designated agency for the subregion (Washtenaw County) (to which Schornack responded that it already was in the legislation). The recommendation from the FTF was, finally, very tentative. It was clear from their statement that the pending RTA legislation left the TMP very much up in the air. The analysis conducted by the sub-group was built on several assumptions about the level, type and timing of funding available from the State of Michigan. The recently-proposed legislation affecting transit funding and organization in SE Michigan, introduced since the last meeting of the sub-group, suggests that those assumptions may not be complete and should therefore be revisited. The letter from Berriz to his committee makes it even more explicit that the committee is simply unable to make a final (funding) recommendation with the state legislation pending. …we don’t know what the Governor’s plan will look like in its final form, and without that information it’s difficult to say that pursuing the track of a countywide millage is the right thing to do at this time. Therefore, in my opinion, it’s premature to pursue any millage option at this time until we have a clearer picture of what the efforts now underway at the state level will look like in their final form. Moving forward with a millage at this time is not prudent as there are too many parts of the current economic model that we have been asked to review that may and likely will change once the final legislation comes into play…I respectfully request that we table our work at this time, and I would ask that reconvene at some later point once we have a clearer picture of what the statewide efforts look like in their final form. 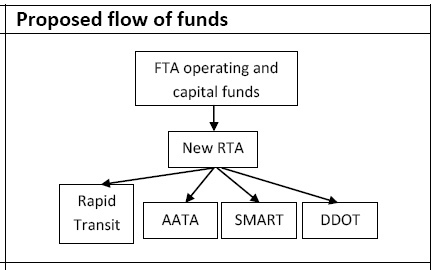 What the FTF’s recommendation actually consists of is a number of changes to services to be included, changes in fares, and a figure stating the likely amount of additional funding that must be found – whether by a millage or other type of funding. But as Berriz’ letter states clearly, all of that is tentative. Under questioning, Smith and Schornack expressed a belief that legislation might be through both houses by May, though they complained that a number of representatives had small local issues that they were concerned with. At the same time, Schornack expressed a wish for even stronger legislation than is currently being proposed. (He also confirmed that Washtenaw County has no opportunity to opt out of this plan.) Throughout the meeting, both Schornack and Smith clearly demonstrated that the real issue is the lack of coordination between the two metro Detroit bus systems (SMART and DDOT). Alarmingly, many of the subsidiary measures appear to be aimed at enforcing some discipline upon those two agencies. For example, there is punitive withholding of funds for lack of coordination. The uncertainty of the effect of the RTA Act on Washtenaw County is likely to undermine this effort, particularly any referendum for local funding. 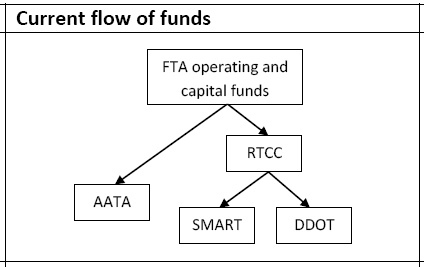 AATA will no longer be able to guarantee that it will implement the plan if the local funding is approved…The RTA is required to coordinate the operating and capital plans of the transit agencies…It could be as little as collecting and organizing the plans of the transit agencies and working eliminate overlap or duplication. It could also be as much as determining the local service to be operated throughout the region, including Washtenaw County. For example, will AATA have to get RTA approval for local service changes? In the midst of all this flux, no one has thought to question what the effect of forming an entirely new regional agency (the Act 196 New Transit Authority that is the subject of the 4-party agreement and the draft Articles of Incorporation) might be as the metro Detroit RTA is being organized. There would be two transit authorities/agencies in Washtenaw County, AATA and the NTA. But the NTA is not (by the terms of the 4-party agreement) to become a “successor agency” with regard to Ann Arbor’s assets until there is a popular vote, presumably for a millage but possibly for a local vehicle registration fee. That is unlikely to happen before 2014. (There is not time this year to coordinate a millage vote, and no clear direction to have one.) So what would be the status of the two parallel authorities? To which would the RTA turn in its effort to coordinate regional transit over the entire area? And which would receive Federal and state funding via the RTA? Surely, the Washtenaw County Board of Commissioners should examine the Articles of Incorporation closely with these questions in mind. I would think that the BOC might even prudently table the matter until the RTA legislation and all its facets are fully known. I would like to think that the leadership of the BOC would take all actions possible to protect our local bus service from being controlled through a multi-county agency that is really focused on metro Detroit. 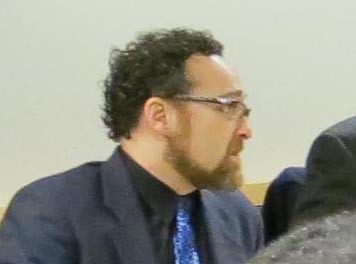 But then, that would be Conan Smith (who is the chair of the Washtenaw County Board of Commissioners). ADDENDUM: A coalition of local lawmakers was formed to promote the regional transit concept. R-PATH is represented in Washtenaw County by county commissioners Yousef Rabhi and Barbara Bergman. Most of the posts on R-PATH’s website so far seem to emphasize the Bus Rapid Transit routes across metro Detroit rather than the transit agency revisions. UPDATE: According to Michael Ford’s report to the AATA board in the April packet, the RTA bills have passed the Senate committee. There is no information about amendments on the state website. SECOND UPDATE: An editorial in the Detroit Free Press implies that the Senate is near action on the key RTA bills. THIRD UPDATE: At a so-called Ann Arbor District Advisory Committee meeting on May 14, AATA staff and chair Jesse Bernstein stated that they are working directly with the Governor’s office to set Washtenaw County aside from the RTA so that it is its own RTA. The rewritten legislation has not yet been introduced into committee. The comment was made that the draft legislation may pass the Senate first and then have to be reworked in the House. Timing of the changes to legislation and of the legislation itself was discussed. It was stated that if action does not take place before the end of the current session (said to be May, which is now half gone), it is likely to be enacted in the lame-duck session after the November elections. At the meeting, a Partners for Transit worker identified herself as affiliated with the Michigan Suburbs Alliance. The Partners for Transit group has been producing newsletters (here is the May 2012 issue which contains some nice maps) and is supposedly a volunteer citizen group. It has been more or less housed in the WATS office but evidently is now being supported by Conan Smith’s shop (he is the executive director of the MSA). This entry was posted on April 2, 2012 at 12:53 am and is filed under politics, Transportation. You can subscribe via RSS 2.0 feed to this post's comments. You can comment below, or link to this permanent URL from your own site.